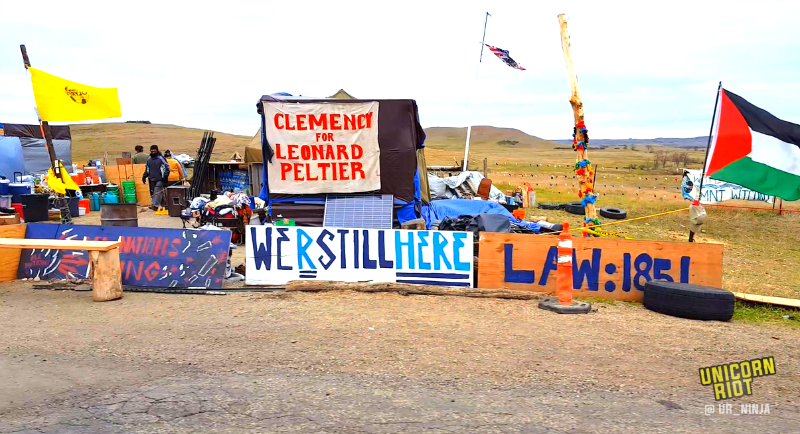 Since April 1st, 2016, Unicorn Riot has been covering the Sacred Stone Spirit Camp, and the subsequent #NoDAPL movement, to stop construction of the Dakota Access Pipeline (DAPL) underneath both the Missouri and Mississippi Rivers. Over three hundred tribes have come together to say no to the Dakota Access Pipeline. We’ve lived in a camp alongside these nations, sharing their culture and traditions and standing united in what some have called the largest gathering of Native people since 1898. Over the last month, various law enforcement agencies, private mercenary organizations, and other DAPL assets, have expanded their aerial surveillance, “information” checkpoints, and use of heavily armed riot police backed by MRAP‘s and Bearcat armored vehicles. Amidst the militarized crackdown on demonstrations against the pipeline, hundreds of people have been arrested, including four Unicorn Riot journalists. The first two arrests of Unicorn Riot journalists covering the #NoDAPL movement were in North Dakota during a direct action on September 13th. The other two arrests occurred in Iowa, on October 7th and October 12th, while covering the Mississippi Stand direct action campaign against DAPL. All four Unicorn Riot journalists have been charged with criminal trespass, while documenting various actions taken by water protectors to stop pipeline construction. Our journalists were also strip-searched during their arrests. All four reporters currently facing charges were actively engaged in reporting breaking news at the time, and would have continued documenting and broadcasting if not directly prevented from doing so by their arrests. During a September 13th direct action at a DAPL construction site, two Unicorn Riot journalists were targeted and arrested while reporting during a live broadcast. Our reporters were both wearing their press passes and stating “I’m press” at the time of their arrests. While they were held in the Morton county jail in Mandan, an individual who called to ask about the status of our reporters was told “we arrested them because they were with the protesters.” Below is a video of the arrests. Both journalists were released 10 hours later on a $250 bond. Both have pled not guilty; and trial dates have been set for December 23rd and January 12th. As the pipeline construction expands across the mid-western United States, encampments resisting the pipeline grow in both North Dakota and Iowa. In early October, Unicorn Riot journalists traveled to Iowa to document the horizontal drill boring under the Mississippi River and the actions from water protectors were taking to stop construction. On October 7th, in Lee County, Iowa, after live streaming an action (from a tree perch outside DAPL property) during which two women locked themselves to a horizontal directional drill, another Unicorn Riot journalist was arrested and charged with criminal trespass. On October 12th a fourth Unicorn Riot journalist was arrested by a Lee County Sheriff’s deputy, and charged with trespassing while documenting a direct action that stopped pipeline construction. They were released after being held on a $300 bond. This bond being the first known time that the Lee County Sheriffs had issued a bond amount for a person arrested at the construction site. When a press release came out on April 1st of a Spirit Camp set up to actively pray to stop the Dakota Access Pipeline, Unicorn Riot was one of the few media organizations on the scene. These four arrests present a clear pattern of arrests and criminal charges against many independent media organizations covering resistance to the Dakota Access Pipeline. Tying journalists up in court by trespassing them from covering events, issuing warrants, bogging them down with criminal charges and paying fees, effectively guarantees the media has less resources to cover ongoing historical events. A similar disregard for the press was apparent when a Lee County, IA sheriff deputy told Unicorn Riot staff “you don’t have a journalist“, after we inquired about our reporter who was currently being held in jail. The repeated arrests of reporters cost time, energy, and funds, which would otherwise be put directly into continuing to report on this ongoing story. Attacks on media organizations create an environment where the actions of DAPL security and law enforcement cannot be properly documented by the press. This makes it possible for state (or corporate mercenary) forces to commit serious human rights violations while avoiding accountability for their actions. Despite these attempts to restrict the freedom of the press, Unicorn Riot’s all-volunteer, educational, non-profit, media collective will continue to provide front-line independent coverage of the ongoing resistance against the Dakota Access Pipeline. Here is our early summer reports of the anti-Dakota Access Pipeline struggle: March 29th, “Tribal Citizens Prepare to Blockade Bakken Oil Pipeline“; April 3rd, “Tribal Citizens Build Camp in Path of Oil Pipeline“; May 5th, “Sacred Stone Camp Resists Dakota Access Pipeline“; and May 27th, “Dakota Access Pipeline Blockade Enters 2nd Month“.